The Moroccan cuisine is incredibly delicious and inexpensive. Their plates are comprised with a mix between sugar and sweets. The traditional plates are usually pastries. (such as pastries with pigeon meat as an example). 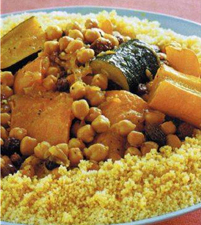 The other plates that are famous in Morocco are the Harira, which is stew that people eat every day of the Ramadhan as well as couscous, plate very popular consisting with semolina, eggs, sheep and vegetables. The fishermen who are waking up very early in the morning love the â€˜Bissaraâ€™ or smashed beans, they add a bit of oil and grinded cumin. Bars and restaurants in Morocco, also offer French, Italian and Spanish plates. They usually propose a three course menus are composed of starters, main course and desserts. Those menus are normally the cheapest. The VAT is generally not included. 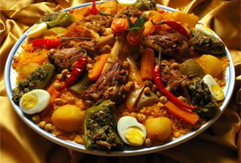 The other typical plates are Tajines, with is made up of a stew of chicken, or sheep very can be quite spicy. The Djj Mahamara consists of stuffing the chicken with semolina, almonds and raisins. The Mechoui is the meat of roasted sheep in spit roasted and the Kab-el-ghaz are pastries with almonds. You are able to eat in many bars their most popular selections are spicy spit roasted meat and kebabs. The Moroccan diet is very balanced thanks to a variety of stews composed with vegetables, salads, and meats. The slow cooked meat is made to be very tender and is different because they mix sweet ingredients such as raisins, plums or almonds. We can speak of the couscous being the national plate, which needs a very long and complicated preparation. It is not just semolina, vegetables and steamed meat but is also followed by a sweet and spicy sauce; the meat is ready to serve when tender at the touch and not just the mouth, with regards to the spit roast, they must be cooked with braise. Finally we will note the Kefta of beef burger which is incredibly delicious and also much appreciated during the trips. It is possible to find Tapas in the North of the country thanks to the Andalusia influence; you are be able to try the taste of small fried fishes, olives, mussels, small fried almonds and a great variety of salads. All those starters can be served with beers such as Flags or Stork that we will find in the different bars of Tangier, Tetouan, Asilah, Chaouen or Al-Hoceima. In Morocco it exits a few liberals' laws with regards to the alcohols. Furthermore the bars for tourists open until late. The beers, the wines, and the mineral waters are of a very good quality, due to the fact that the importations are very expensive. However the national drink is the mint tea, composed with leaves of mint and green tea, with a lot of sugar. The coffee is very strong except for breakfast. A lot of bars get "stars" with the service. Morocco has a lot of very well known wine, farmed and reserves. It could surprise you that a Muslim country has so much wine-producing. It is due to its colonial heritage. You will be able to find in Morocco, white wine "shellfish special" rosé and even grey "The Grey of Boulauane" and red like "the light of Gerard Depardieu" with its sparkling red colour. However, those wine are only served in partner restaurants that are only in big touristic cities. Tips are normally included in all hotels fares. With regards to the waiters, hairdressers, and the hotel staff, it is normal to give some dirham.